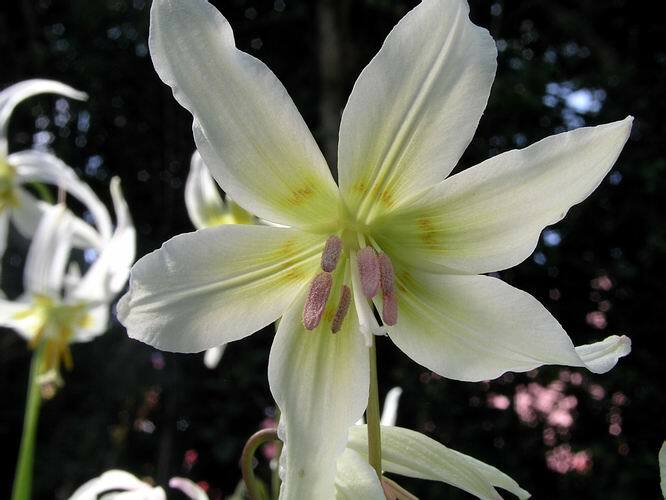 When you raise Erythroniums from seed, especially cultivated seed where we have so many species growing in a relatively small area, inevitably some hybrids will appear. 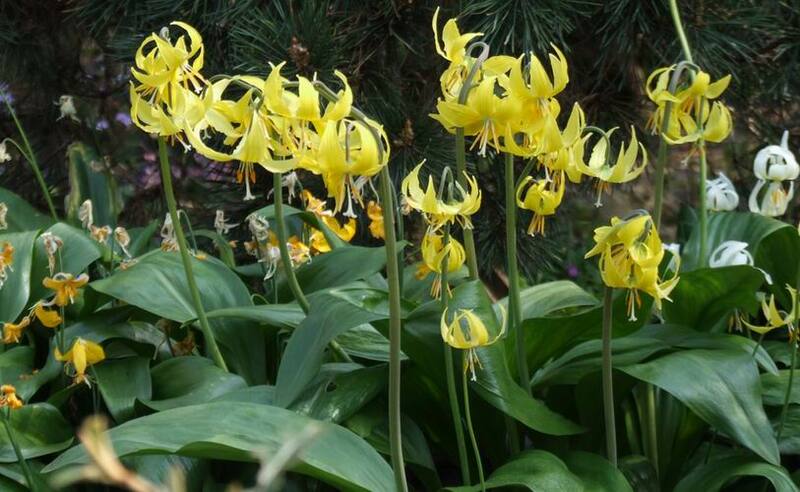 While I think it is difficult, if not impossible, to improve on the beauty of the species erythroniums the one area we can work on is how well they increase by offsetting - most of the hybrids seem to inherit this feature even if the parents do not increase. 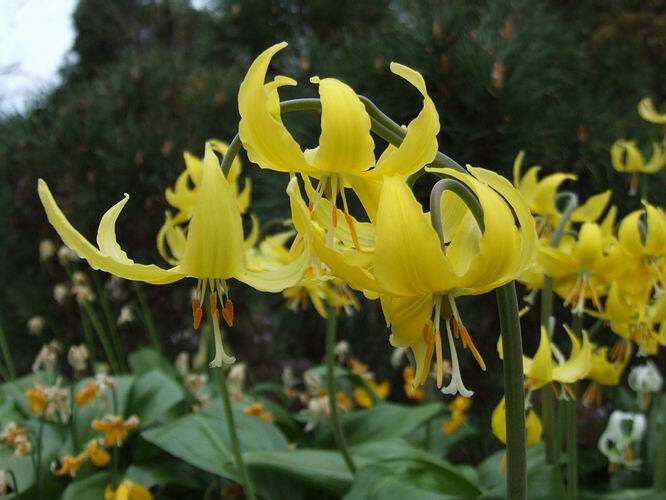 There are not many named erythronium hybrids available apart from the larger Erythronium tuolumnense hybrids like 'Kondo' and 'Pagoda' which have been widely available for a very long number of years. The finest of the tuolumnense hybrids I have seen is the large stately yellow E. 'Susannah' one of many fine hybrids raised by the late John Walker. it can easily produce 9 flowers when it is growing strongly. Another of John Walker's hybrids that is sometimes available is E. 'Mini Ha Ha' a good vigorous white, clump forming hybrid related to and very similar to E. oregonum. Two similar plants, raised by E.B. Anderson and passed on to Kath Dryden with the number EBA 4656 have been named by Kath Dryden. 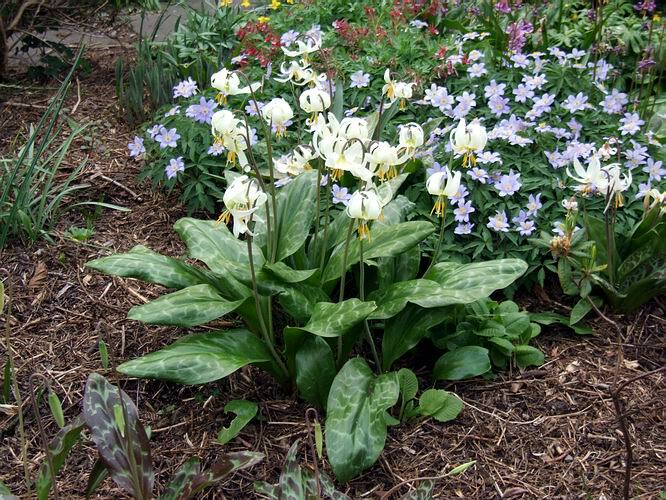 Erythronium 'Jeanette Brickell' and E. 'Margaret Mathew' are both basically creamy white and look superficially like E. 'White Beauty' and share the same ease of cultivation. E. 'Jeanette Brickell' is not pink as it appears in the excellent book 'Bulbs' by Roger Phillips and Martin Rix this is most likely a trick of the printers ink. Another E. tuolumnense hybrid sometimes listed is E. 'Joanna' it has a pink tint overlaying the yellow outer petals, not always the most attractive colour but in this case it is not muddy like so many hybrids with a yellow and a pink parent can be. There are a lot of hybrids going around unrecognised and masquerading as species. I have seen several of these on the show benches that are fine plants and worthy of names as they obviously increase well and hopefully one day we will get them all sorted out. 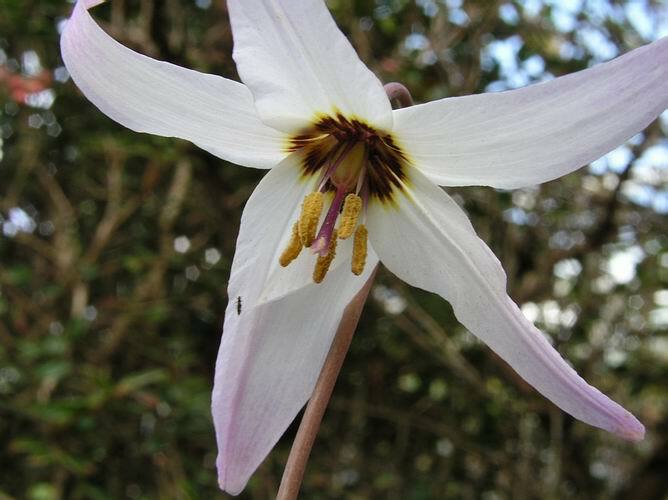 Part of the problem is that nearly all the erythronium hybrids I have grown are fertile and will produce seed most years and while the resulting seedlings show some slight variation they look very similar to the parent and this is why we are seeing hybrids appearing with species names. There are some naturally occurring hybrids where the range of two species overlaps and hybrid populations occur. There are some very nice wild hybrids between Erythroniums citrinum and hendersonii, these hybrids are often fertile, resulting in a nice range of colour forms but none to my knowledge are increasing quickly enough as a clone to justify applying a cultivar name. 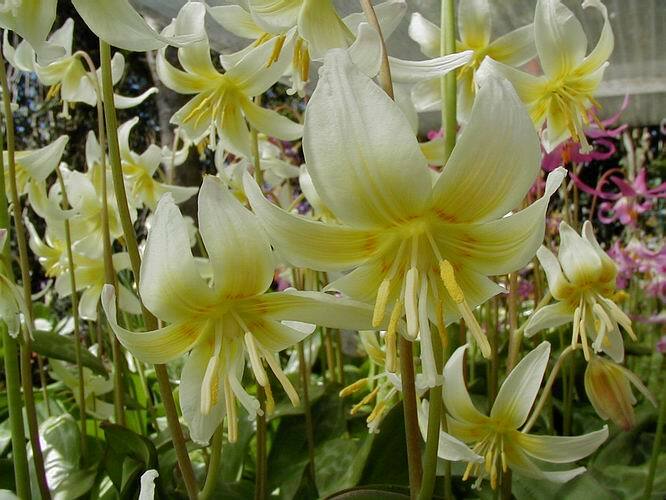 There are also a lot of fine hybrids involving Erythronium revolutum and some of these are now being named. We named our best one 'Craigton Cover Girl' which was selected for both its beauty and the good rate of increase, a single bulb will soon form a clump. Like so many of our best hybrids this was raised from seed collected from an open pollinated flower which my notes state was Erythronium oregonum, the other parent must be E.revolutum. Looking at the flower I cannot see any obvious signs of E.oregonum from its features E. californicum looks a more likely parent. 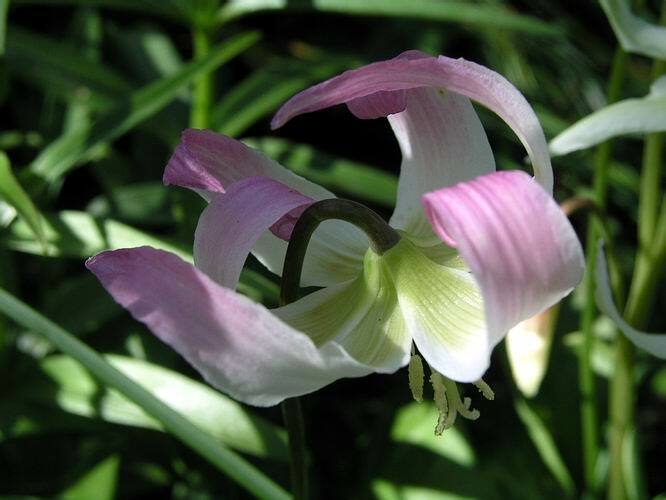 While it is desirable to keep careful records of all hybridisation mistakes and confusion can occur and I have to admit that my attempts to make specific crosses have failed and all the best erythronium hybrids that I have raised to date have been open pollinated. 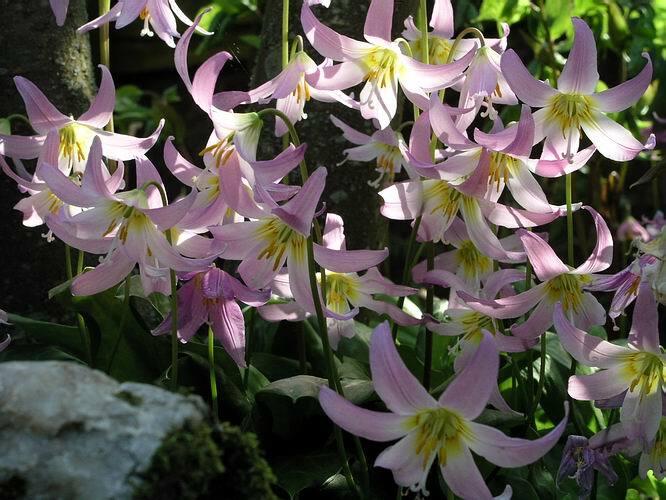 I have seen several other hybrids similar to 'Craigton Cover Girl' appearing both old and new, you should look out for these as they are all worth having if you are looking for a pink erythronium that will increase well. 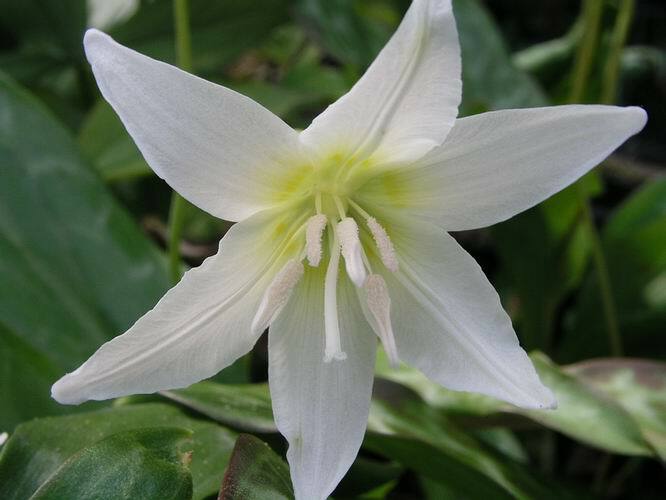 Another of our open pollinated hybrids 'Craigton Cream' was raised from seed taken from Erythronium helenae - again the clone I named was selected for both its beauty and speed of increase. 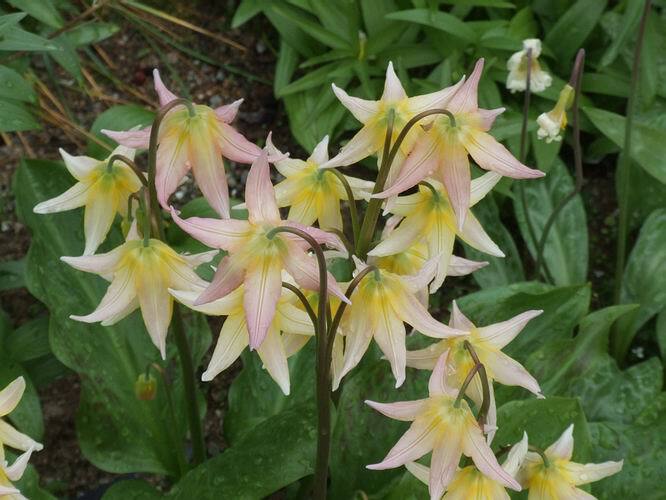 We have a number of other very interesting hybrids, all from open pollinated seed, that show potential, most involve Erythronium revolutum, californicum and hendersonii in their parentage.